The immense demand for methamphetamine (ice), ecstasy and new psychoactive substances among the wealthy urban residents of East Asia and beyond has revitalized organized crime in the region. The scale of recent drug seizures in underground laboratories in China’s Guangdong province alone is staggering – and it’s jumped by 50 percent in the last year. 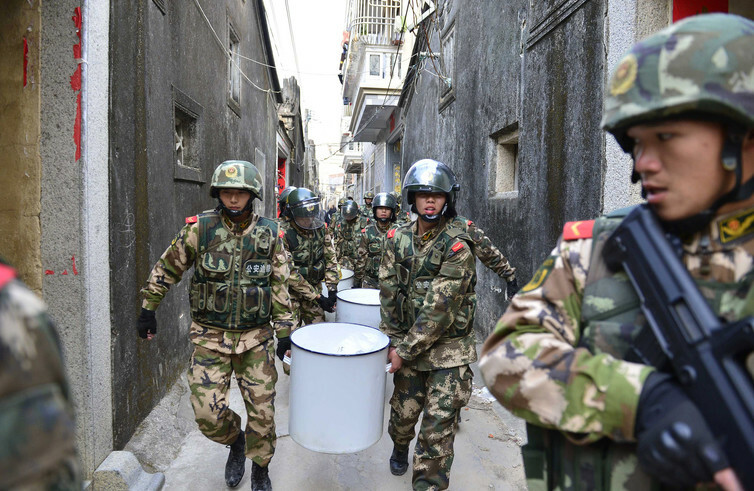 In January 2015, for instance, 2.2 tonnes of solid and liquid methamphetamine destined for Shanghai were uncovered in the coastal county of Lufeng. In May that year, 1.3 tonnes of ketamine and 2.7 tonnes of its precursors were found in the city of Yangjiang, disguised as black tea bound for Southeast Asia. Responding to the challenges posed by organized crime groups are a handful of capable law enforcement agencies; a patchwork of cross-border mutual legal assistance agreements; and a fledgling regional security response from Asean. These agencies struggle to have an impact on the scale of criminal enterprise in the region. They are also constrained by concerns about sharing intelligence with potentially compromised police, customs and military services. In 2013, the United Nations Office of Drugs and Crime (UNODC) estimated that crime groups earned about US$90–$100 billion a year from illicit sources. Narcotic production and trafficking in drug precursors were the most lucrative, followed by illegal wildlife and timber trading. UNODC found human trafficking, illegal e-waste disposal, maritime crimes ranging from piracy to illegal fishing, counterfeiting of medicines and “high street” products and underground gambling were the most damaging crimes. It’s easy, then, to see why the burden of transnational crime is often borne by the poor people of Southeast Asia. A growing demand for timber and wildlife products puts pressure on cash-strapped communities to collude with criminal groups in extracting and marketing these resources. And the Japanese yakuza and triads or “black societies” in Taiwan, Hong Kong and South Korea also seek opportunities to dump e-waste in under-regulated jurisdictions. Southeast Asia’s lucrative markets, combined with the availability of and demand for consumer and medicinal products, have proved irresistible to criminal enterprises. This is illustrated by the fact that cross-border movement of illicit products into and out of Southeast Asia, often via India and China, has intensified in recent years. This is due, in part, to free-trade agreements between ASEAN and these countries, as well as the massive upgrade of the region’s infrastructure and connectivity now under way. 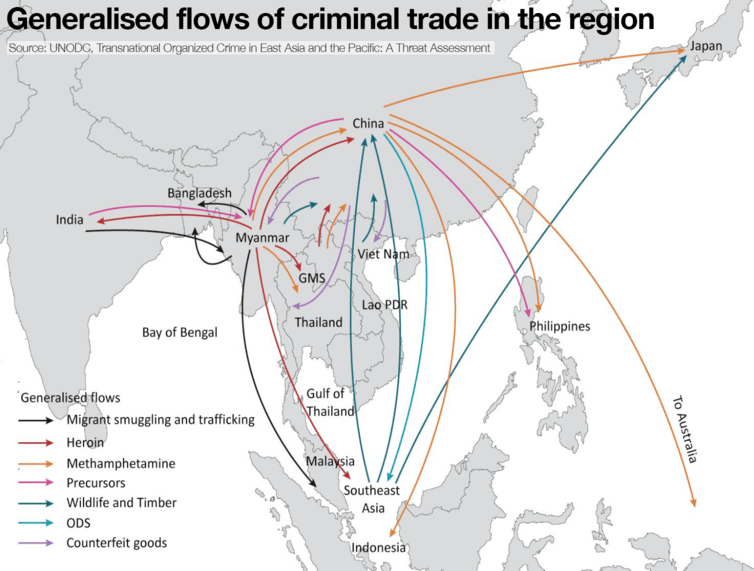 Organized crime groups in East and Southeast Asia are diverse and often ephemeral. Some, such as the triads of southern China, have survived since the 19th century. Others form and disband in a generation or less. The defining feature of organized crime is that it offers protection services – the enforcement of contracts – for illicit markets. In circumstances where state-led conflict-resolution is weak, it can provide similar services as legal institutions. Law-enforcement agencies now routinely observe convergence and connectivity among different Asian crime groups. Former ethnic or linguistic distinctions once associated with traditional organized crime groups, for instance, are now blurred. And major Chinese and Japanese crime groups are increasingly connected with Mexican, West African, Iranian and South Asian crime groups. This reflects the impact of the globalization of trade and the increasing wealth of China, India and the region. Opportunities abound for expanding into industries or locations unhampered by existing protection providers. Strategic violence still plays a crucial role in enforcing contracts in illicit markets and establishing distribution markets. Hong Kong triads, such as the Sun Yee On, merged with or rented local protection services in China and Southeast Asia as China opened up its economy. These looser macro-criminal networks are often referred to as “red-black” in Chinese, a euphemism for collaboration between the criminal world and corrupt elements of the state. This occurs at the county level in China or at the sub-state level in the Golden Triangle, as the tri-state confluence of Burma, Laos and China is known. The Triangle is now also known for the mass production of amphetamine-type stimulants, such as ecstasy, built on the older tradition of opium production and heroin refinement. Along with amphetamine-type stimulants, “ice” pills and heroin are transported from production areas in northeast Burma in modest quantities of a kilogram or less — below the prevailing legal threshold for trafficking — to markets in Bangkok, Yangon or Kunming. This method, known as “ants moving house,” earns the successful smuggler US$2,000 per run. Larger amounts may be diverted via Cambodia for trans-shipment to highly profitable markets such as Australia and Japan, where premium wholesale prices beckon. The lack of effective action to suppress problems such as illegal drugs, counterfeiting and wildlife extraction reflects Asean’s relatively weak integration with regard to security problems. Until there’s a sense that Asean is a community with a shared fate, effective coordination to combat organized crime is likely to be little more than window dressing. Most Asian governments have given economic development priority over concerns about illicit trade and organized crime. Progress against organized crime will remain ad hoc unless this changes. Worthy but nonsensical aspirations to be a “drug-free” region by 2015, set out at the 2010 Asean Ministerial Meeting on Transnational Crime, and the Work Plan on Combating Illicit Drug Production, Trafficking and Use adopted in 2010 by the seventh Asean Ministerial Meeting on Transnational Crime, signal this weakness. Alternative policies that seek to regulate recreational drugs and the pursuit of harm-reduction strategies would help undercut the profits of criminal groups. Policies that reorient consumer choices to undercut the goods and services organized crime provides would also help. The key to effective suppression of organized crime will be the action of the Asean+3 group (the three being China, Japan and South Korea). China’s awakening to the high cost of fake and often dangerous products, as well as the perils of using “ice” for the young, should help reduce the scale of organized crime activities in the region. Chinese-led restrictions on the export of precursor chemicals – effective from late 2015 – could be significant if followed by India and Asean. Harsh alternatives are brutal and undermine the rule of law. Attempts to curtail demand by resorting to extrajudicial police killings may have popular appeal, but as with former Thai prime minister Thaksin Shinawatra’s controversial 2003 war on drugs, Philippine President Rodrigo Duterte’s campaign against drug pushers may ultimately serve to consolidate crime groups, raise protection costs and temporarily displace activities to less hostile locations. By December 3, Duterte’s “war on drugs” had seen 2,028 drug crime suspects killed during police operations while 3,841 deaths had been attributed to vigilantes. The high risk of homicides involving vigilantism shows the campaign is out of control and corrosive of the independence of courts. Any hope of reducing the impact of transnational crime will depend on reducing the demand for illicit products as well as enhancing the legitimacy and effectiveness of law enforcement.